A Whiteboard Wall Canvas?! It’s Easy If You Do It Smart! PinShareTweetRedditBuffer Being able to letter on my walls has actually been a dream of mine for quite some time. A whiteboard wall was the only option after my husband was appalled that his hard work painting the wall was going to be drawn over! 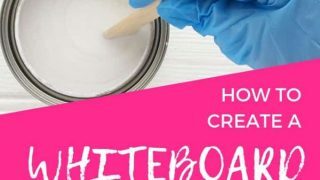 I was thrilled to discover the paint brand Escreo who offer … Continue reading A Whiteboard Wall Canvas?! It’s Easy If You Do It Smart!